Make your wedding day more "you" with color, pattern and dramatic accessories. “This year, embroidered details are a ‘must-have’ style,” says Dayna Isom Johnson, a trends expert at Etsy.com. She says the site has seen a 40 percent increase in searches for embroidered bridal-wear this year. Floral and celestial motifs are most popular, Johnson says, with hand-stitching giving a folksy-meets-formal flair. And speaking of sleeves, Conway has noticed the statement sleeve: long bell sleeves or voluminous puff sleeves. Bridal gown designers are thinking outside the white lines, offering dresses in blush, navy, celadon, peach, violet and ombre hues. Vera Wang has gowns in fashion-forward scarlet, cafe au lait and even black. Bulgarian design studio Tonena Atelier has a soft gray gown decorated with romantic leaves and blooms. And Salt Lake City designer Natalie Wynn does a figure-flattering, A-line cream dress sprinkled with blue and gold stars. Conway is also noticing a bit of flapper flair: “Fringe and feathers are fun details, especially on shorter, flirty dresses that brides are changing into for late-night dancing,” she says. But there’s room for a pared-down look, too — think Meghan Markle’s sleek Givenchy gown. “We’re seeing a return to simplicity in some dresses. 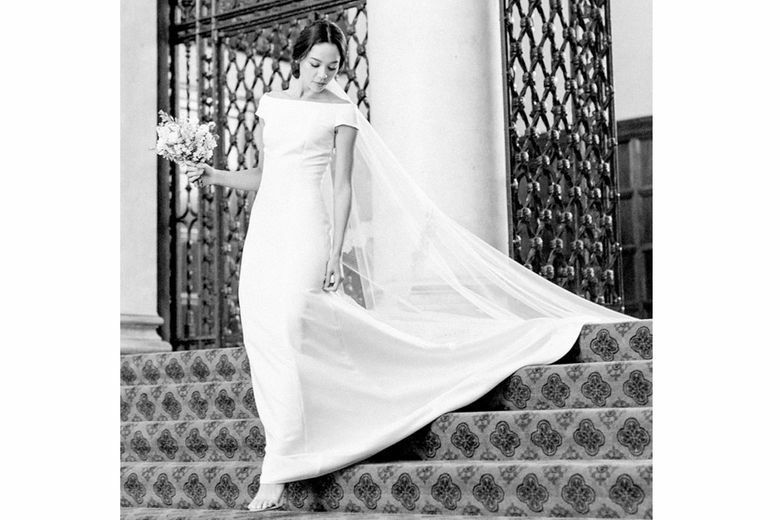 Clean, virtually unadorned designs in luxurious fabrics look elegant and timeless — and put emphasis on the bride,” Conway says. 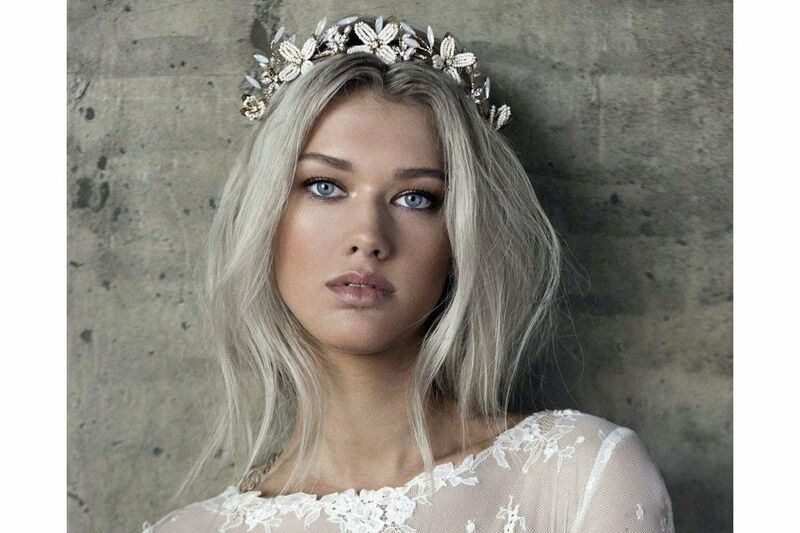 Brides with simple, streamlined gowns are pairing them with eye-catching “statement” veils, perhaps dressed up with tiny stars or decorative trims, Johnson says. Katie Howieson, in Sedgefield, England, crafts a fingertip-length veil trimmed with gold stars. She also makes hair combs and headpieces decorated with metallic flowers, leaves, crystals and golden Swarovski pearls. Sandra Silveyra, in Vancouver, British Columbia, who calls her studio Olivia the Wolf, creates understated hair accessories out of seed pearls, brass flowers, glass and stone beads. Johnson says searches for bridal capes were up nearly 50 percent this year. 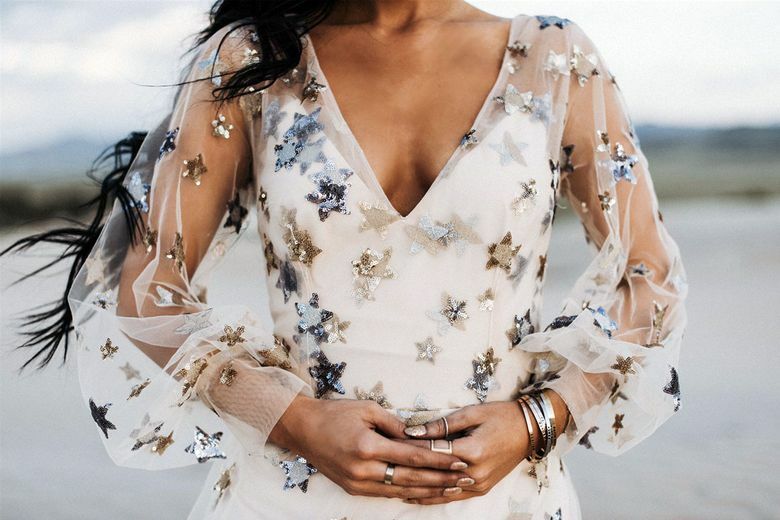 “Designed for the bride looking to stand out, they also provide shoulder coverage during a traditional ceremony, or a quick pre-reception change,” she says. Besides capes and capelets in lace or silky fabrics, look for motorcycle-style jackets and sweaters. Ivy and Aster has a comfy cashmere wrap sweater in ivory or blush. And Brooklyn, New York, designer Rebecca Schoneveld gives the modern bride a powerful silhouette with georgette capes paired with satin pencil skirts. One of the hottest jewelry trends, stacking rings, is also big in the wedding world, says Johnson. Crown of Light has a sapphire-and-diamond-encrusted ring that can fly solo or be stacked with colorful sister rings. Pink — home décor and fashion’s pet hue — has found a foothold in the engagement-ring market. Morganite, a mineral found in pinky hues from blush to salmon, is selling well, according to WeddingWire.com. It’s being placed in rose gold, platinum and gold settings. Look for other unique stones, like tourmaline, emerald, opal, garnet and geode, as well as freeform “raw” stones. Colleen Banks, jewelry editor and senior associate style editor at Martha Stewart Weddings, is planning her own wedding this summer. She says chandelier earrings are back. 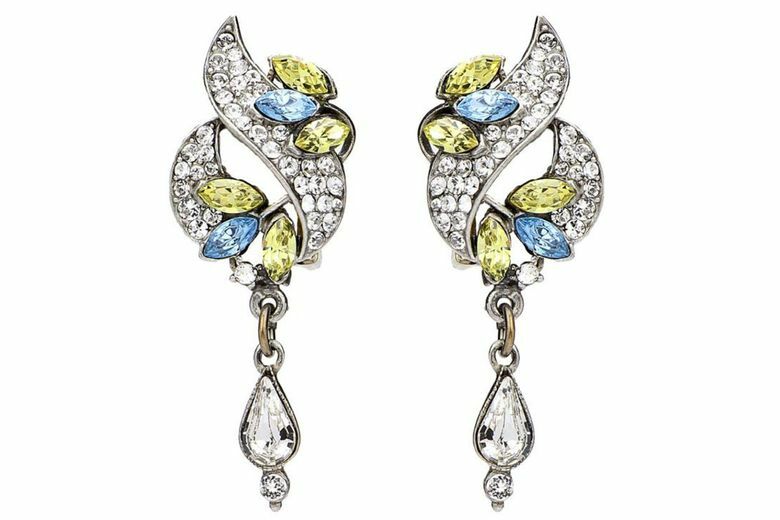 “There’s nothing better than a statement earring, especially on your wedding day. I’m definitely breaking out the statement earrings for the reception,” says Banks. For his Ben-Amun label, Isaac Manevitz designed tiered crystal earrings inspired by the shape of peacock feathers. 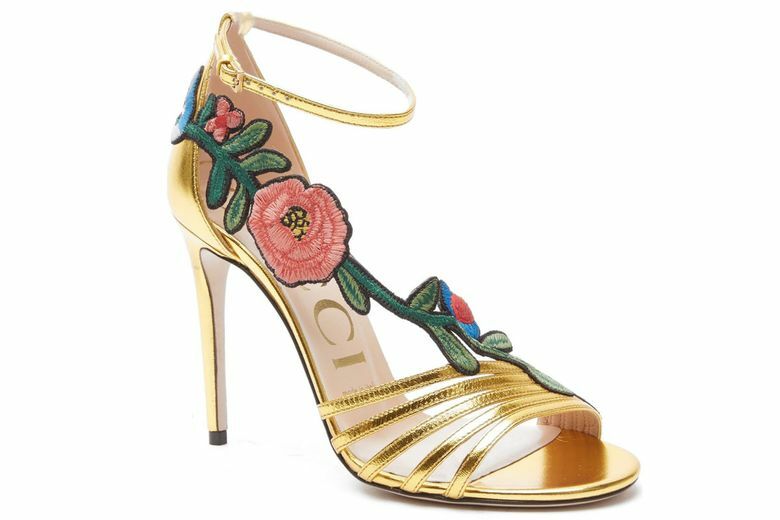 Banks plans to wear floral-print shoes to her wedding as part of a floral theme that includes big bouquets and floral-print bridesmaids’ dresses.